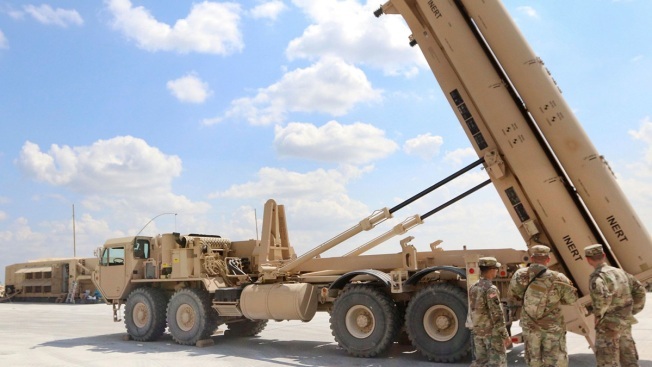 A soldier with Battery Echo, 62nd Air Defense Artillery Regiment, 69th Air Defense Artillery Brigade, shows members of the brigade staff around the training area developed specifically for the Terminal High Altitude Area Defense (THAAD) weapon system, Sept. 20, 2018, at Fort Hood, Tex. Saudi Arabia has signed a letter of offer and acceptance with the United States for Lockheed Martin’s THAAD missile system, a significant step forward in the $15 billion deal, a State Department spokesperson confirmed to CNBC. Manufactured by Lockheed Martin, the Pentagon’s top weapons supplier, THAAD, or terminal high altitude area defense, is regarded as America’s crown jewel in missile defense systems. The Saudi Embassy did not respond immediately to CNBC’s request for comment. The development comes as Saudi Arabia is under fire over the killing of journalist Jamal Khashoggi, as well as its role in the war in Yemen. President Donald Trump, meanwhile, has cited the importance of defense deals in defending his decision to stick with the kingdom in the aftermath of the slaying. Saudi Crown Prince Mohammed bin Salman has denied knowledge of the attack, although the CIA reportedly concluded that he ordered Khashoggi’s death. Saudi Arabia and the U.S. entered formal discussions for THAAD in December 2016. “After completing required congressional notifications in 2017, followed by many months of negotiation, signing letters of offer and acceptance marks a step toward protecting the United States and its regional partners from Iranian-origin missiles,” said the State Department spokesperson, who spoke on the condition of anonymity. “The sale of the THAAD missile defense system benefits U.S. national security by supporting the long-term security of Saudi Arabia and the Gulf region in the face of the growing ballistic missile threat from the Iranian regime and Iran-backed extremist groups,” the spokesperson added. Thomas Karako, director of the Missile Defense Project at the Center for Strategic and International Studies, echoed those notions. Saudi Arabia’s oil-rich monarchy is one of America’s most crucial strategic partners and a significant patron of U.S. defense companies. The Saudis are the top buyers of U.S.-made arms, a title that has safeguarded the kingdom from retaliatory sanctions over the killing of Khashoggi and the war in Yemen. In an extraordinary statement last week, Trump affirmed that the U.S. would continue to stand with Saudi Arabia, linking the countries’ relationship to his “America first” platform. Trump has also commented on the potential impact to defense suppliers if the U.S. were to sanction the Saudis over the Khashoggi killing.